I don't think it's that, because if I use "grow selection", it works perfectly. The problem is only with "soft selection". Of course there's no rigging anymore, but I think I know how to put it back with DazStudio. And UV mapping is still here ! I used the figure transfer utility with the original item as a model and I got back the rigging, and it seems to work well, and the soft selection also works now ! There was an additionnal step though as if I imported directly the mesh in studio I got the problem back in Carrara at the end (the option that makes it work in Carrara doesn't exist in studio). 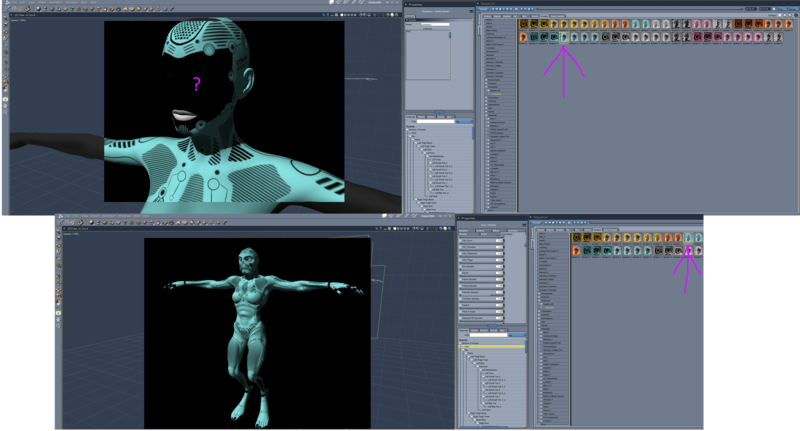 So I had first to export the obj in dae format (in Carrara) and import that dae in studio. I had to alter the scale and very slightly the position. When loaded straight into Carrara, any poses applied to it would not work. Solution: In DAZ Studio open Dog 8 (or one of the Breeds), then click on the Edit Tab, click on Figure, then click on Rigging in side tab, then click on Convert TriAx/General Weight to Blended Weight. Once this is done then go into the File Tab and save as a Chracter Preset, save to a location where you can find the file, I also added "bw" to the filename to indicate it is now blended weight. Load the blended weight file into Carrara. It will have black eyes from the EyeMoisture shader. Another item that needs to be converted to blended weight. Follow the procedure for converting to Blended Weight as outlined in DAZ Dog 8. Both the main body and the Tendril need converting to blended weight. If loading the Tendril after the main body, parent the Tendril to the head but Fit to None. If loading multiple Tendrils parent each to the head, when the DSF File Import tab opens click on Import as new. Position each Tendril pair as required. Some of the morphs when applied also close the eyes. Also when the provided poses are applied an error message comes up, you will need to manually pose the figure. I will have to stop buying stuff soon !!!!! Requires Mistys Genesis 3 workaround available at Rendo. Load Janette first of all. In Genesis 3 Female, look in the Character for System 46, don't click on the two options under Character, but click on System 46 folder to find two options, click on one of them to apply to Janette. 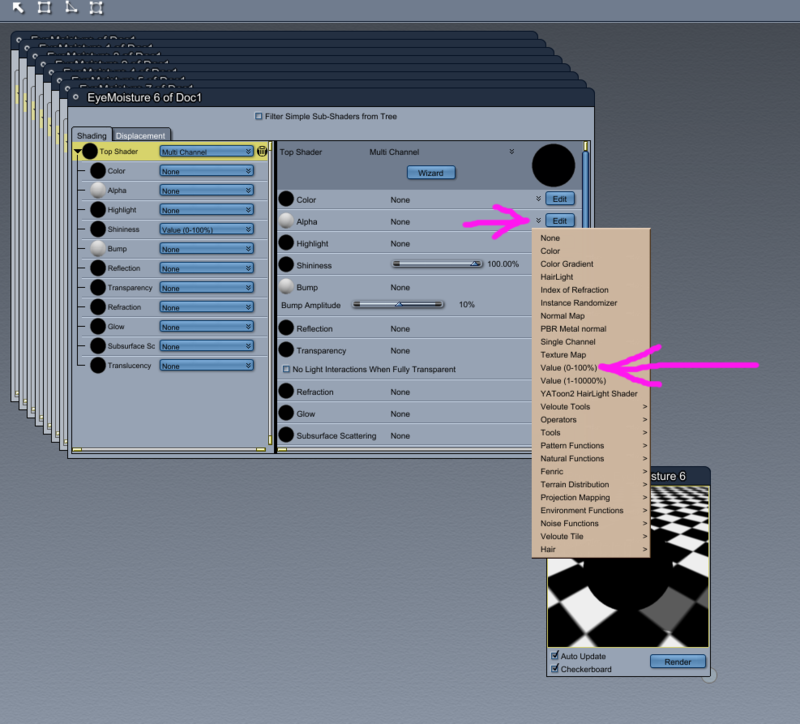 Next click on Materials folder, select one of the full character options. 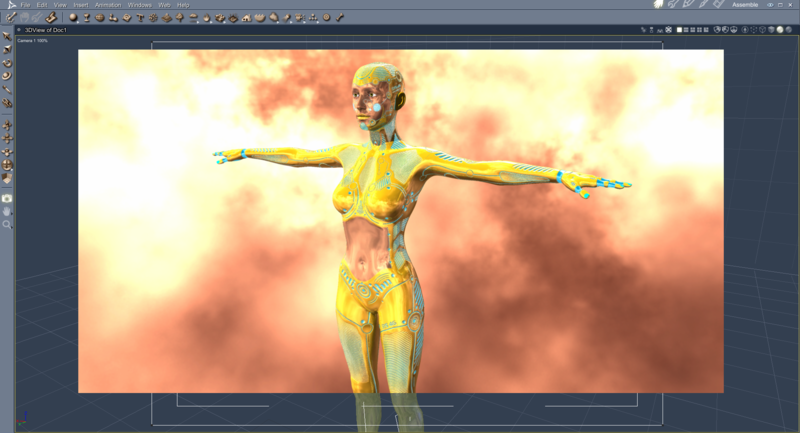 Once applied there will be a problem with both the Cornea 1 & Eyelash 1 shaders. Click on both the Cornea 1 & Eyelash shaders to edit them. In the Alpha channel click on the double down pointing arrows to bring up the options, click on Value (o-100%), leave at 0%, change both shaders. Looks good when applied, will be useful for my Sci-Fi critters. System 46 - after a little graphics work and Glow channel application. Bunyip, excellent information, on all the above, thanks! I feel bad because I had bought both System46 and Dog8, immeadiately used both in Carrara and never thought to share my methods in doing so. The Blended weight conversion I even created a DAZ studio keyboard shortcut for. Hello Wendy, when I first saw Dog 8 I thought "oh-no, Gen 8 problems for Carrara" but I saw that you were adding hair to the dog so I thought that it must be workable. When I loaded Dog 8 in Carrara imediately found the problem with the rigging so I followed Misty's advice about converting to Blended Weight (thanks Misty). System 46, would love to see a screenshot of your layers in the shaders !!!! I muck around with the graphics in Paint Shop Pro as I enjoy doing that type of work. 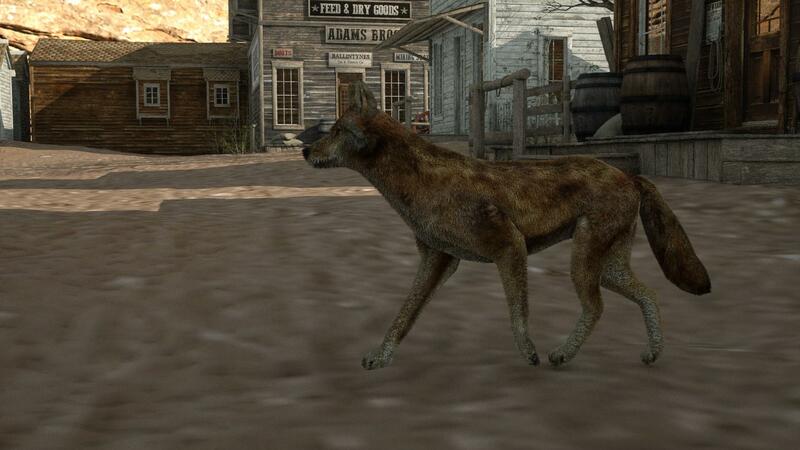 I downloaded the 30 day Autodesk Maya trial and soon got frustrated by it freezing worse than Hexagon but managed to export some Unity asset mb Coyotes as FBX which loaded fine in Carrara and as animation groups could share the created NLA clips on one. @th3Digit can you tell/show the steps for making that shortcut? I missed this post.. thanks Wendy..
Is very tempting but I do have a couple of earlier models which are quite nice, having said that, you can never have too many dinosaurs. you can never have too many dinosaurs. Loved dinosaurs when I was a kid, got some E-toys to play with now !!!!!! Usually, stuff for Genesis 2 and earlier figures works fine in Carrara. However, occasionally a speciifc item will have problems. Here is anexample. I am getting an error when I try to conform the top from the outfit called Capricornia to The Girl 6. Have had the outfit forever but never used it. Pretty sure it came in a bundle. I will attach a link to t he product page and a screencap of the error. I have Capricornia in my library. Was wondering if I converted it to blended weight would it work, so did the conversion and tried it, naaahh, came up with a similar error. One thing I noticed was that the error did not crash my computer. Hmmmm I thought !!!!! Posed G2F with an Aiko 6 pose, then loaded the clothing onto G2F "without" fitting to G2F. Next I applied the same Aiko 6 pose to each of the clothing items. It worked. Did not do any morphs on G2F just in case that ruined the friendship. EDIT: If I was going to attach that outfit to Girl 6 I would fit it to Girl 6 in DAZ Studio, save the clothing as a character item, then load those saved items onto Girl 6 in Carrara which would get around having to fit them to Girl 6 in Carrara. I have some items that have the same problem. I usually open in plugin called daz studio and export the item as an obj then import it back into DS onto the figure and use the transfer thingy and in most cases that works. first guess, there prolly a rigid group in the outfit. we saw this with the shirt that time with the rigid buttons. could try removing the rigid group with a text editor, or the dson editor. And the winner is - Stezza !!!! Will do a series walkthrough of the obj-transfer thingy method later on, unless someone beats me to it. Do the tutes as much for my own information as everyone elses, often do something then get six months down the track and I am trying to remember how I got it to work before. I just purchased Secret Underground Base and Submarine. It renders fine in Studio (first picture) but has weird banding in Carrara (second picture). I loaded it into Carrara in several ways, 1. Directly into Carrara , 2. Through Studio as a DUF file, 3. From Studio as an OBJ and I have similar results. It seems to be a geometry issue and not a shader one since it shows the same banding with the default texture (third picture). Any ideas on how to fix it? thats a common problem with a lot of products.